48V 1000W and 750W super power brushless gearless hub motor. (Only for Pedal Assist System,"PAS"). Power: 1000W / 48V or 750W / 48V. You’ll be out cruising along at28 mph without a sweat! Crank speed sensor for pedal assist. Power: 500W / 36V. (Only for Twist Throttle). (Only for Pedal Assist System,"PAS"). You’ll be out cruising along at 22 mph without a sweat! Crank speed sensor for pedal assist. 1x Pedal Assist Crank Sensor. Power: 500W / 36V. You’ll be out cruising along at 22 mph without a sweat! Crank speed sensor for pedal assist. 36V/500W super power brushless gearless hub motor. 1x Pedal Assist Crank Sensor. Wheel type: Rear Wheel. Features 48V 1000W super power brushless gearless hub motor. Reach speeds of 60 miles an hour no problem. 1x 48V 1000W Motor. Combination of pedal bike and motorized bike. Perfect for long riding. This product can be used to convert bicycles into electric vehicles. Name:Electric Bike Conversion Kit Specifications Fit For:22-28 inch ordinary bicycle Rated Voltage:36V Rated Power:250W Flywheel Teeth:16 Rated Speed:3300 rpm Reduction Ratio:9.78 Features -Environmentally friendly material, durable and easy to operate. -This kit is suitable for installation on regular bicycles of 22-28 inches. -This kit is not suitable for modification in special models and variable speed models. Note -Without battery and charger!!! -Due to the manual measurement,there might be some error. E lectrical machine：48V 500W. 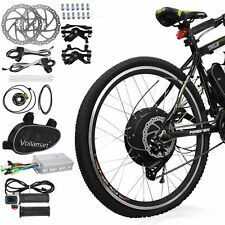 141105 Mountain Bike Modified 48 500W E-bike Conversion Kit 1 set 48V. A: Installing motor circle ：. Circuit wiring connections, following the instructions. The kit is front wheel. Part Number: BBS02B. Quantity: 1 Conversion Kit. 48V 1500W. Power: 1500W / 48V. Perfect kit to convert your standard bike into a top-of-the-line performance electric bike. Wheel type: Rear Wheel. 1 x Pedal Assist Crank Sensor. Motor: Brushless Gearless. The BBSHD heralds a new age of factory installed mid-drives. Unlike most other factory mid drives the BBSHD is designed to be mounted onto almost any bicycle currently manufactured. You can mate the BBSHD to any bike with a bottom bracket that is anywhere from 68mm to a much wider 100mm fat bike. This product can be used to convert bicycles into electric vehicles. Reduction Ratio:9.78. -This kit is not suitable for modification in special models and variable speed models. 1 x Electric Door Lock. Want to convert your bike into a top-of-the-line electric bike?. Our e-bike motor kit can help you to achieve it. The thumb throttle display s battery leve ls intuitively, you can turn it on / off at a press. 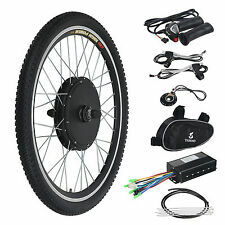 Features Description This Electric Bicycle Kit includes everything needed(except battery) to convert your standard bike into a top-of -the-line performance electric bike, which delivers unequaled performance and reliability. You’ll be out cruising along at 22 mph without a sweat! . Compatible with bafang Motor BBS01, BBS02 BBS03, and BBSHD. 1 500C display. Mid Drive Motor. LCD Display Panel: information on screen very clear, easy to read in direct sunlight when riding. Hub Motor Kits. All the buyers should have experience to install it. If not, please do not buy it. install the kit on my 18 speed/24 speed bike. it is difficult to install. This kit is designed for normal bike, not for the bike that can shift gears. However, you can install the kit on the left hand side if your bike is18speed/24speed... you need to mount the freewheel on the left hand side on your rear wheel axis, and spot weld to secure it. After you have installed the kit , you can still shift gears on your bike. But if you don't know how to weld, we recommend you to buy our hub motor kit or our "mid-mounted" kit . battery recommended for this kit: This kit is 24V, you need two 12V batteries, (lead acid or lithium), or one 24V battery.After they are linked together, the recommended capacity >15AH, wo. Electric Bicycle Components. Electric Bike Battery. We have been specializing in the electric bike and DIY electric bike for more than eight years. •IP54 waterproof. •Compact and lightweight design. •LED light color: yellow lights for indicators; red light for a tail/brake light. Features: 36V 500W powerful brushless gearless hub motor. Nylon tire& alloy rim& stainless steel spoke that is so durable. Brake handles allow you to safely cut off the power supply from the motor in the case of an emergency. 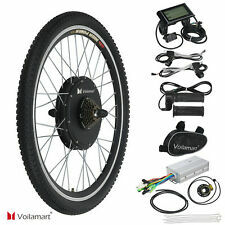 A perfect replace kit for your electric bicycle,e-bike. High power controller guarantee big current supply. 48V 1000W and 750W super power brushless gearless hub motor. Power: 1000W / 48V or 750W / 48V. Crank speed sensor for 8 Point High Efficient Pedal Assist. LCD display shows battery level and pedal assistance settings. This item is for the bike that uses the hub diameter less than 50mm. Important: This item doesn't include battery or charger. This is our newest kit for electric common bike, this kit mounts the sprocket on the wheel spokes, so it fits most of bicycle wheel. Motor use freewheel so when wheel rotating, the motor will not rotate, just like a normal bike, this can reduce resistance. The twist kit includes: 1. 1x 450W 36V brush motor with freewheel 2. 1x Chain 3. 1x Customized sprocket & components 4. 1x Motor controller 5. 1x Mounting plate bolts 6. 1x Twist throttle (with battery indicator & key switch) Motor with freewheel: (with this freewheel, when you step pedal without motor power, the motor will not rotate, so reduce drag). BionX PL-250 M E-bike Conversion Kit. 26V 9.6AH Lithium ion Battery. Six bolt disc brake rotor mount. 250 watt hub motor. Battery removable from slide mount for charging. The kit is front wheel Electrical machine：48V 500W. 141107 Mountain Bike Modified 36V 500W E-bike Conversion Kit 1 set 48—60V. A: Installing motor circle. Circuit wiring connections, following the instructions. Do you want to convert your traditional bicycle into an electric bicycle?. With the help of app, you can monitor your driving speed, mileage, and gear. Motor: 30V 240W DC motor. Answer: It is proper for the bicycle of 700c wheel s.